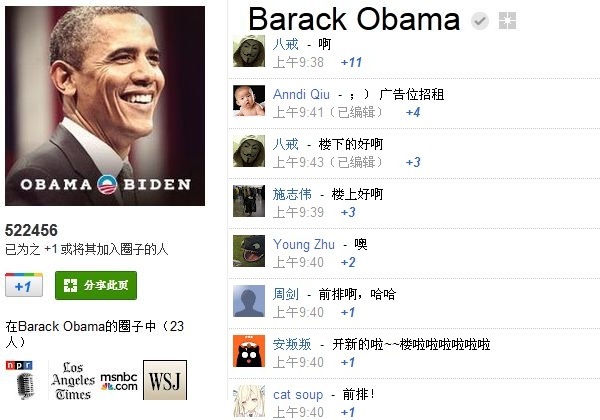 Many Chinese have taken up a call to “Occupy Obama’s Google+” over the weekend in the style of Occupy Wall Street in order to feel “close” to the popular world leader as well as air some of their views. Hundreds of Chinese have flooded US President Barack Obama's Google+ page, apparently taking advantage of a glitch in China's censorship system to post about human rights and green cards. At first glance, it looks like the official Google+ page is being spammed, but taking a look at some of the comments left in English, you’ll realise that it’s Chinese citizens who have taken to the social network to decry their government’s appalling human rights track record. Some netizens urged Obama to help free activists such as blind lawyer Chen Guangcheng, who is currently under house arrest, or Liu Xiaobo, the jailed Nobel Peace Prize winner. Some comments left by the Chinese called for free speech and human rights. Others asked for information on getting U.S. "green cards" for immigration. Some more extreme comments urged President Obama to work “to free” the Chinese people. The White House in Washington has not commented on the upsurge of Chinese interest in President Obama's campaign site.